When staff head into the hilly terrain of Nepal in 4x4s, on motorbike or on foot, they have to travel light. 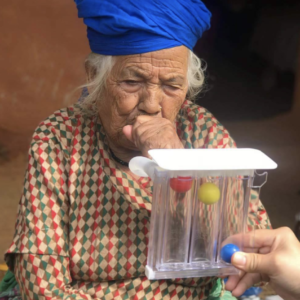 When they arrive at a vulnerable Gurkha veteran’s house, they have to have the equipment to diagnose and treat them. It’s a catch-22, and one which our team have been wrestling with, and adapting to, since we introduced a more mobile approach to providing aid. Thankfully, we have been able to take advantage of technological advancements which have allowed us to re-equip staff with more mobile and lightweight medical kit. A spirometer is a piece of kit for measuring the volume of air inspired and expired by the lungs. We recently began using a version of the kit which links up with an accompanying app via Bluetooth to record test results on our phones. We use a wireless clinical-quality ECG device. By diagnosing heart abnormalities in patients with no other access to medical assistance we have been able to refer them for immediate treatment, often saving their lives. Our team use electronic ThermoScans which measure the infrared heat generated by the eardrum and surrounding tissue. 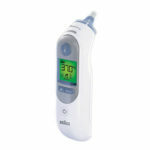 The thermometers have a digital LCD screen which give instant results for our staff. 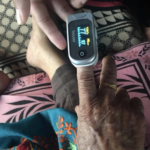 Pulse oximetry is a non-invasive method for monitoring a person’s oxygen saturation. A clip-on sensor is placed on a thin part of the patient’s body, usually a fingertip or earlobe and the device gives a reading on it’s screen. 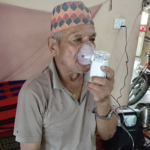 Our portable nebulizers are devices which give our team a fast, efficient method of delivering medications directly to the airways of the lungs. We use them to treat conditions like asthma, COPD and other respiratory diseases or disorders. Of course, the kit listed above doesn’t come cheap. We offer a standard of healthcare for Gurkha veterans and their families in Nepal which is second-to-none. Without your continued support, it simply wouldn’t be possible.